Dr. Theo Tsaousides and Jeff discuss Dr. Tsaousides book “Brain Blocks” and the things we do that sabotage ourselves. Self-doubt, procrastination, impatience, multitasking, rigidity, perfectionism, and negativity are issues we all struggle with as sales professionals but also just as human beings. When we carry these blocks into our sales discussions, we are doing a disservice to ourselves and our customers. Find out how to overcome them in this episode of The Buyer’s Mind. [7:33] Is it just the way our brains are wired? [10:37] The brain vs the gut or logic vs emotion which is more important? [21:58] How much control do we have over these blocks? His mission is to help his clients use their brains more efficiently for the pursuit of their goals. He is a brain-training expert, with extensive research and clinical experience. He is a faculty member at the Icahn School of Medicine at Mount Sinai and St. John’s University in New York. His academic work focuses on improving executive functioning for people with brain injuries. 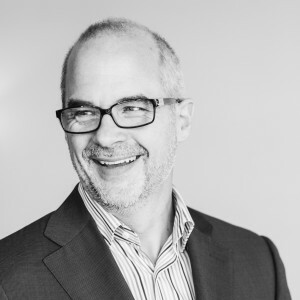 He also provides training to individuals, groups, and organizations, nationally and internationally in the areas of problem-solving and emotional intelligence. Man: Welcome to “The Buyer’s Mind” where we take a closer look deep inside your customer’s decision-making mechanism. To reverse engineer the perfect sales presentation. Now, please welcome your host, Jeff Shore. Jeff: Well, welcome everyone, once again, to “The Buyer’s Mind.” So glad to have you here. And so appreciate your dedication and your diligence to want to know more about the way that your customer makes purchase decisions. Because, you know, if you understand the way they want to buy, then you can make it easy for them to do just that. And that is our job as salespeople. We want to make it easy for customers to do what they want to do anyway. And today we’re going to talk about how we train the brain. How we train our brain and how we help our customers to train their brain as well. Joined as always by our show producer, Paul Murphy. So what do you think, Murph, do you train your brain? Can you train your brain? What do you think? Paul: You know, I’ve been working for the past year to train my brain and get a little bit more on the sales side of things and not so much of the video side. Jeff: But it’s interesting because there’s the educational part of that, but then there’s just training the way that you think. And in some ways, I would think, you know, as I approach it, the educational part, just what do I need to know, how do I get more knowledge, or even more wisdom is one thing. But to train the very way that I think sounds complicated. Paul: Yeah, habits are part of that, aren’t they? And I’ve been working very diligently to change some habits in my life. I’ve developed some bad habits. Jeff: Yeah, yeah. And I think you’re right, the habits, well, look, my take on habits is that they are shortcuts, right? If I have to think about every single thing I’m going to do in my life, my brain is going to explode and so I rely on habits. And that can be a very, very healthy thing to do. If I’m doing things that are good for me, you know, exercising, flossing my teeth, saying thank you, these things are all good for me. So if I’m in that positive habit, and it all works really, really well, think it’s the negative habits, even the negative thinking habits. And I think that’s what we really want to get into today, is the idea of positive thinking habits. How do we have that habit of things like patience, like proactiveness, like flexibility, all of those things that are about the brain? And I think you’re going to enjoy our conversation today with Theo Tsaousides, as he gets into it. This is his life study, how do you train the brain? I think you must train the brain. And again, not just by reading, but by your understanding of your own brain and brain of your customers. Listen, that’s why we started “The Buyer’s Mind” way back when my passion is about understanding how we make decisions, even when we are doing that on a non-conscious level. How much of our brain operates in ways that we don’t fully understand? That is my passion. I find that so interesting. And I know if you are a longtime listener to this podcast, you find it interesting as well. And that’s why I’m so thrilled to have Theo Tsaousides on the episode today because this is right in his sweet spot. This is what he does. So I’m just going to encourage you as we get into the interview to really look at it and ask yourself some tough questions. Ask yourself some really introspective questions about the way that you think, and the way that you can think more effectively. You know we always love it here in “The Buyer’s Mind” when we have people who are passionate about the same things that we’re passionate about, about taking that really important but pretty wonky stuff and making it approachable for everyday practitioners. And I’m thrilled to have on the podcast, Theo Tsaousides. He’s a brain training expert with extensive research and clinical experience. He’s a faculty member at the Icahn School of Medicine at Mount Sinai and St. John’s University, New York. He’s also the author of the book “Brainblocks: Overcoming the 7 Hidden Barriers to Success.” He is in essence a brain trainer. 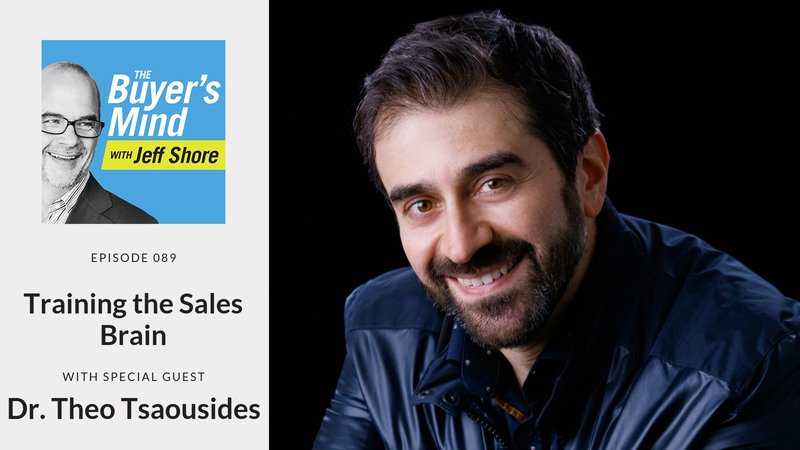 Please welcome to “The Buyer’s Mind,” Theo Tsaousides. Theo, how you doing, sir? Theo: I’m doing very well. Thank you for having me on the show. Jeff: Oh, yeah. Let’s have some fun. You know, you started your research career studying brain injuries. Yes? Theo: Yes. That’s right. That’s, brain injury rehabilitation is my professional specialty, actually. Jeff: So that must been a fascinating way to study the brain because, you know, as a brain expert, you and your kind are always looking for variances in order to figure out the way that the brain works, right? It’s an impossible organism just to peel back and poke around in. But it would seem that with injuries, it opens up a whole field of study that you wouldn’t find in any other way. Theo: Absolutely. And the great thing about the work that I do, is that we’re not just studying the brain, we’re studying the people. So the work that I do a lot involves, how do people who have a brain injury get…how does that affect their ability to go on with life? And a lot of the people that I work with are high, you know, professionals in very challenging professions. So after the brain injury, they’re finding themselves not being able to do their job as well as they used to. So studying the person with a brain injury and how now they can continue to do well in their environment, and what can we do as brain trainers to help them is very rewarding. Jeff: Because part of your task…I’m certainly not an expert in this area, but I assume part of your task is to try and find neural pathways to be able to connect dots that had been separated by a brain injury and somewhat. Theo: Yes. The thing that we know is that the brain works in certain ways. And it’s very important to know the nitty gritty, you know, what’s going on inside our skulls. But then there’s the person and the person is not going to simply correct their pathways themselves. There’re ways that they can do that. And then it comes back to what can the person do? How can they train their brains themselves? What kind of exercises, what kind of strategies can be used so that they can help develop those neural pathways? They can take advantage of neuroplasticity, they can improve their cognitive efficiency after the brain injury. But the same rules apply to any kind of brain as well because the brains work the same way, whether they’ve been injured or not. In other words, we have the same kind of machinery, the same kind of engineering and knowing how that engineering is working at a micro level, we can then figure out what are the rules that we need to use so that could become more efficient in the way we approach our goals. Jeff: Does it bother you then, from time to time, when you hear somebody whose language is very defeatist, very victimized, I can’t help it, it’s just the way my brain is wired? Or is there some legitimacy to that? The way you were describing it is, if we can help people who’ve had brain injuries to re-engineer their brain, then it seems to me that we could help just about anybody to re-engineer their brain. Theo: I believe that we can. And at the same time, I want to give merit to the people who say, they can’t because their brain is wired that way. And in the moment, that is true, their brain is wired that way. But that wiring is not permanent, it’s not inflexible, it’s not unchangeable. So what we need to understand is that, even with deep forms of pathology, that there are ways to change that wiring and change who we are. You know, it’s interesting that you bring the “who we are” kind of thing. One of the most interesting things to me is how we attribute a lot of what we do to our personalities. We say, “Well, this is the kind of person that I am.” And if you look at deeply how we measure a personality, it’s really answering questions that have to do with how we think, how we feel, and how we act. And those are things that we can change. And if we can change these, eventually, we’re going to change our personalities. Jeff: All right. It’s fascinating because, for me, I do admit to being a little bit of a cynic, when I hear people who take on a defeatist tone. Mercy is not probably my strongest social attribute. I’m more of a rub some dirt on it, kind of guy, unfortunately. But I do look at it and say that there are times when even for me, as I’m being self-reflective, that I believe that I have more power to change than I sometimes give myself credit for in my worst moments. It’s got to be an exciting time to be you, Theo, because what we are learning about the brain is advancing exponentially, perhaps even with the assistance of artificial intelligence that we’re going to see a continued explosion of what we understand about the brain. It’s got to be a really exciting time to be in your line of work. Theo: It absolutely is. And the discoveries that have been made have made our work much easier as well. So just starting with simple concepts that people talk about a lot, neuroplasticity, for instance, is one of them. And I think that’s a very valuable concept for people to understand exactly what that is, knowing that what we already knew that people can learn new things is now supported by science that says that, yes, indeed, we actually make changes to our brains by doing the things that we do. That is really important because now we know that we have a brain that’s alive and hungry for learning more and ready to be changed in the ways that we want to change it. Jeff: I want to talk about brain blocks here in just a moment. But just one question that comes to mind as we’re thinking this through is, the concept of…and this might be more on the psychological side than it is on the neurochemical side. But the concept as we commonly think of it as logic versus emotion, or the brain versus the gut, how much do you get into that? And how much do we see by looking at the brain? What’s happening and what would be called the emotional core of a human being? Theo: I really like this question. This is one of my favorite topics lately because we used to think that there’s a logical brain and there’s an emotional brain. And that the two are in constant battle. And that some people tend to be more relying on their emotional brain, whereas others are more reliant on their logical brain. And that’s the way the world works. And it is not that way. It is not that simple. Yes, there are certain parts of the brain that are more in direct control of the emotional responses that we have. But what we…even the way we think about emotion nowadays with neuroscience is teaching us is very different. There isn’t a logical brain, emotional brain. There’s one brain that does kind of like both things. And it does it in such a smooth, balanced way, that if you think about it, every logical decision that we make entails emotional components to it. And every emotion that we have has a very clear cognitive aspect to it, has a very clear logic to it. So the two are working very well in tandem. And the more we realize that, the more we can take advantage of the power of both. Jeff: I love that concept. You know, I like to think of it, the way that I’ve always understood it is the idea that, you know, that when you say that every emotion has a clear logic to it, I’m not sure who said this once, but they were taught it to me. But the concept that there’s no such thing as irrational behavior, right? All behavior is rational from the perspective of the actor. And that really changes things. And I just think about our audience who lives in the sales world. And so sometimes dealing with customers who are acting what they would think to be in an irrational manner or an emotional manner. But you’re saying, no, if you connect the dots, every emotion has a logic at its basis, somewhere. There’s always some form of logic going on in that person’s brain. Theo: Absolutely. There’s a reason why each emotion exists in each person, right? And for each person, this will be different. What we think of as irrational behavior is probably behavior that doesn’t fit our own expectations, our own standards and norms, and we call it irrational. But like you said, from the perspective of the actor, there is a very clear rationale for why they’re doing what they’re doing. Now, the tricky part is that we each operate in our own bubbles, right? And this is where my work is important, is helping understand that what you carry within you, you know, the logic that you use to make your decisions, the emotions that are fueling or coloring these decisions, and how you come across is one thing. Then you have another person who is the receiver of all that information and everything you do, and everything you say. Now, they’re going to filter it through their own mental, emotional, physical filters. And there is a point where what you say may not necessarily be what somebody else hears. So you say one thing, I filter it through my own internal systems of mental and emotional processing, and I hear something entirely different. And what I’m going to respond to is not what you said necessarily, but what I heard. Jeff: There’s a lot of interpretation that goes on in the brain that we’re oftentimes not going to hear because it’s based on their own perspective history, biases, experiences, whatever it might be. Let me ask you, you think about this stuff all the time. So I’m a sales expert, I think about sales all the time. And so when I’m in a buying environment, I’m always evaluating the sales professional and the sales process, it’s just what I do. I assume you’re much of the same way. When you are in a decision-making mode for yourself, when you’re shopping for, you know, a car or a watch or a shirt or whatever it is, are you consciously aware that now that you know what you know, how much of your decision is emotion based? I mean, it’s…you know, those of us on the outside, when I look at and say, well, people like you that study the brain, if they’re going to select, you know, a mate, a spouse, a future sexual partner of some kind, that they’re probably going to look at it and say, “Well, what are the odds that this person can produce the offspring that I would be looking…? What are their physical characteristics?” And of course, this is so silly to us. When you were in that position, where you were making a decision, are you more aware? Or does it just sort of wrap you around the axle a little bit, and try to make a decision knowing that you don’t even know your own brain as well as you think you do? Theo: There are moments where I’d feel like I’m totally wrapped into the emotion of the moment. The awareness is variable, right? So I am aware of the decisions that I’m making. I wish I could tell you that I make logical decisions all the time. But it’s impossible to make logical decisions all the time, just because we come equipped with the emotional machinery in the brain. And for me, it’s always a balance between pleasure and pain, just to bring in the emotional aspect to my decision. In sales, a lot of the times salespeople will have to focus on the pain points of their potential, the prospective customer. From the customer’s perspective, from the buyer’s perspective, there’s also this need to balance the pain and the pleasure of making that decision. If I’m going to buy a car, how much pleasure is going to cause me to buy to have that car, to own that car, to drive it down the highway? And how much pain is it going to cause me knowing that now I have to make enormous car payments, or that this is taking away from my budget from something else. So in that very moment, that you make the decision, if you don’t become aware of those two forces, you may kind of go with the one that’s more predominant. So if the pleasure is more predominant, you’re going to make that decision, and you’re going to feel good about it in that short term period. If it’s the pain that’s predominant, then you’re going to decide not to. You’re gonna opt out of making the purchase. But if you become aware and you kind of do a little bit of an analysis and say, “Okay, what’s gonna be the long-term cost here? What’s going to be the short-term cost? What’s going to be the long-term benefit and the short-term benefit? Then you can make a better decision. And by that, I mean, you can be better prepared to deal with whatever outcomes or consequences you anticipate already. This is a different way of saying that, well, if you make a big purchase, have you done your budget? Do you think how you’re going to cover the cost for other things? Are you going to be able to continue to pay rent for instance? Or is this car payment going to take up all your income. So it’s the…the emotional forces are informing our logical decisions in a very spectacular way. And it’s really important to step back in that moment and say, “What do I need to do?” Now, what sales people can do is, facilitate that decision in understanding where that balance is between the pain and the pleasure of buying. Jeff: Yeah, it’s interesting because that emotional side of things that can be so powerful, really is much more of a short-term phenomenon, right? If we’re thinking long term, we’re much more likely to introduce the logical side of things, is that correct? Jeff: Let’s talk about your book “Brainblocks,” which really deals with how we assess what gets in the way of success, right? The subtitle, “Overcoming the 7 Hidden Barriers to Success.” And I love the concept before we get into the book itself. I love the concept. And I think where you’re headed with this is the idea that if you remove all of the obstacles, well, the goal is so much easier to achieve. So we do tend to look at it and say, “What’s the goal out there? What do I want to accomplish?” And then, “What do I have to do without really paying much attention to what the obstacles that are in the way?” But you’ve laid out seven obstacles and say, if you could deal with things up front, watch out, you will be unstoppable in the goal setting department? Is that a fair way to describe the premise of the book? Theo: And the other part is that, it’s very hard to eliminate these things because they are part of our wiring. And it’s important to understand that there won’t be a time in our lives where we won’t have moments of procrastination, just to refer to one of the brain blocks. But there will be times when I will be procrastinating, I need to become aware of it, and now what are the strategies that I can use to overcome that moment of procrastination. Over time, we develop better habits that help us circumvent these kinds of obstacles, these kinds of habits of thinking and feeling and acting, that get in the way. Jeff: All right. So when you look at the book “Brainblocks” we’ve got it separated into seven different brain blocks. It was interesting, as I was looking at this and just in preparing for this discussion, I see myself in all of these things, self-doubt, procrastination, impatience, multitasking, rigidity, perfectionism, and negativity. I assume that there is something of a…if you looked at these as computer dials at any given time, I would be getting different reads that these are constantly fluctuating constantly going up and down. Theo: Yes, that’s right. It’s like moments of each brain block at different times and in different situations. Jeff: So if you look at it from that perspective then, how much control would you say that somebody has over that? Is that something that is just, “Hey, it’s how you’re wired?” I mean, you’ve already indicated here in this call, that there is some measure of control, would you say that it’s a little control or a lot of control? How would you quantify how much control we have over these things? Theo: This may sound there’s a cop-out, but it’s as much control as you want to have over them. There are some that are obviously more resistant, like impatience is one of them. There are others that are really based on experience and training and being mindful of every little aspect of what we do without being, of course, obsessive and constantly observing what we’re doing. Impatience is the interesting one. And actually, if you don’t mind, I wanted to point it out because it’s one where people who have talked to me about the book, they focus a lot on, self-doubt is a big one because of all the different fears we have. Fear of failure, fear of public speaking, fear of rejection, all of those things are related to self-doubt. Procrastination is a big one. And then impatience, I feel like people almost impatiently read through the chapter and go to the next one. And it’s a very important one, especially in sales because, think about how many times we buy on impulse? How many times we make purchases that are not very well thought through, very impulsive. And think about how many times the sales professionals are trying to sell on impulse as well. And by that, I mean they’re expecting to make a quick sale, having people buy what they’re selling very quickly. And when that doesn’t happen, that leaves them with a sense of disappointment, or that there’s something wrong with the customer, like the customer is irrational. Why would they want this great service or product? But it’s also, how we tap into this is by creating a sense of urgency. We want people to feel like, if you don’t do this quickly, there will be consequences, you cannot miss out on something really great. And we know how FOMO is a big thing nowadays with the social media and what everybody’s doing. We see that and we really have a fear that we’re missing something out. Jeff: There’s a really interesting psychology from the buyer’s perspective right there because I think most sales managers are impressing upon their animal sales trainers too. You know, get the sale, get it really, really quickly. And you’re suggesting that there might be an impulse decision that gets made by the buyer, it may not always be the healthiest decision. Theo: It will not be a decision that will create a long-term loyal customer, because the people who buy fast they want something fast, they won’t get it because most things take time. And therefore, they will lose interest and they will not be engaged anymore. And that means that there will be less loyal, fewer loyal customers in the long run. Jeff: What about just those customers who…like me, I’m an impulsive person, right? So, you know, would you go back to Herbert Simon and satisficers versus maximizers. You know, for me, I’m going to shop until I find something that checks the boxes, and then I’m going to buy it because I got better things to do with my time. My wife is going to look at every single option because she wants to make sure she’s getting the best possible choice. But in my style, if I’m the buyer, you know, it doesn’t bother me if a salesperson is impatient because I want to make a fast decision anyway. Some of this just deal with decision making styles of the customer. Theo: It sounds like you have already created a checklist in your head, though. So you’re not buying something that you haven’t thought through before. So you’re not taking step five before you have taken steps one, and two, and three. You’re ready to make that purchase and though the process that preceded that may have had something to do with your relationship with a salesperson itself, or it may have to do with how much research and how much effort you put into learning more about this without becoming excessive. But you have a mental structure that you’re following, and you’re saying, “Okay, I want this.” There’s no reason to hesitate on this anymore. Impatience is actually the flipside of procrastination in many cases. For your wife, I think that she may want to read that chapter on perfectionism. Jeff: Yeah, I’ll keep that in mind. Absolutely. Absolutely. Theo: Because perfectionism is really that fear of making the wrong decision that can keep you searching and ruminating and stuck in decision mode forever. Jeff: Right. Sure. Yeah. Let’s start talking about one more and then we’ll wrap it up. Talk about rigidity and the issues of rigidity. Theo: Rigidity is inability to change even though we want to change. Rigidity means that we resist something new, we resist something that’s out of our comfort zone, that we’re not comfortable with. And in terms of making purchases, rigidity can be very influential in that, “I have a certain thing in mind and this is what I want and I’m not going to hear anything else that contradicts that.” And that’s very difficult and it requires delicate approach of the sales professional to deal with somebody who has a certain thing in mind that they want and they can’t look at in different ways or they can’t see how one aspect of it may not necessarily be important. But there are other aspects that are from…rigidity is really being stubborn and then the willing to entertain some new idea, a new concept, a new product. I can tell you that it took me a while to get rid of my PalmPilot and go on the iPhone android because I was so happy with it and was doing what I wanted, so I was kind of reluctant to let go of something familiar, try something new now that may not satisfy my needs. Rigidity is also important for the sales professional because rigidity means flexibility. Being able to use new approaches, get the data that you have, use the feedback that you’re getting, and modify what you’re doing. So if you continue to use the same approach across all people and with all attempts that you’re making even if it doesn’t work, then that may be one of the reasons why you’re not connecting well and you’re not making progress with your work. You’re not selling a lot. So it’s the ability to use the data you’re getting in the moment and think flexibly, think creatively, improvise to be able to get through to the person that you’re working with. Jeff: The book is called “Brainblocks: Overcoming the 7 Hidden Barriers to Success.” You can find that over on Amazon. The author, Theo Tsaousides, is just brilliant, right up our alley, great stuff. How can people follow you, find you, Theo? Theo: They can go to my book website, smashingthebrainblocks.com, where I actually have a book on procrastination that they can download for free. They can also follow my blog on “Psychology Today.” It’s called “Smashing the Brainblocks” as well. And they will probably be able to find me on LinkedIn and Facebook as well. Jeff: Love it. We will put all that in the show notes of fascinating stuff, really, really important material. Thanks for all that you do, making our lives easier to be able to change the lives of our customers. Theo Tsaousides, thanks for being on the show. Theo: Thank you so much, Jeff. Jeff: Well, Murph, I told you it was going to be a good interview. I was right, wasn’t I? Paul: Loved it. When are you wrong? Come on. Jeff: As we were going through, I just loved the idea that we can talk on so many different levels. Guy, clearly this guy has done his homework a lot. Theo Tsaousides has done his homework. But as you went through all of the different brain blocks, did you find yourself using that as sort of a scorecard? Theo: I did. You know, you look at some of the things that we typically fall into procrastination and rigidity. And you start to think, I need to think differently about those things. Jeff: Absolutely. I did find that, you know, when I looked at all seven, self-doubt, procrastination, impatience, multitasking, rigidity, perfectionism, and negativity, I could absolutely see myself not all of the time, but certainly part of the time, in each of those different categories. And I just want to encourage everybody who is listening right now, when you look at those seven things, think about it from the perspective of the positive, the flip side to those seven things. When we think about self-doubt, self-doubt, is a choice that we make. And it might be based on a lack of confidence that we have, I get that, but it doesn’t have to cripple us. We can overcome that. You are in your position for a reason. As much as you might feel like, there are days when you’re trying to make things up, you are an expert in what you’re doing. Or we think about procrastination. I have always seen procrastination as a comfort addiction. We procrastinate on things that we find uncomfortable, but we have a choice on that, when to if we lean into our discomforts. When I think about impatience, the impatience that I often have in my life, there are times where just sitting still and letting patients fall over me, will make a huge difference in my mindset. When I think about multitasking, I’m glad he added that to the list because more and more research is showing you really can’t. There’s no such thing as multitasking. The best you can do is dart between tasks and even that never effectively. When he talked about rigidity, and his description that rigidity is about resistance to change. I have something in my mind, this is the way I feel, and I’m not going to be moved from that, then, of course, it’s very difficult to learn new thoughts, or even to consider somebody else’s perspective, if you’re overly rigid in your thinking. He talked about perfectionism, the idea that I’m constantly tracking and then constantly disappointed by the fact that there’s this level that I’m never gonna get to. And then finally, of course, negativity. And that’s so critical for salespeople because your job is to give out positive energy all day long. You can only give out that what you have inside. So if you’re afflicted by negativity, you’re going to have a real problem. I just want to encourage you, the brain can be rewired. It’s not permanent, it’s not inflexible, it is malleable, it can be changed. But it’s going to start with a commitment. And so I just want to challenge you right now to ask yourself the question, what is it in my brain that needs to be changed? And maybe your first step there is to consider which of those seven brain blocks that our guest brought about, you need to grapple with, and maybe buy the book here so that you can try to figure that out. But you can rewire the brain, you can retrain the brain. The brain is that amazing machine and it will perform to the exact specifications, to the way that it’s been tuned. So you got to get out there purposefully, intentionally, and tune your brain. When you do that right, you are the best version of you that you can be and that’s when you have the opportunity to change someone’s work.